885 West Georgia Street is the address of a well-known office tower in Vancouver. 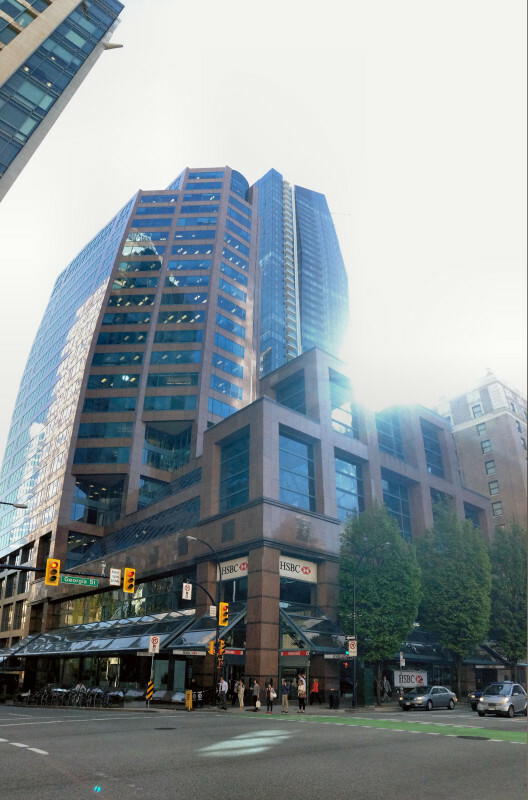 The building, also known as “The HSBC Canada pendulum building,” houses 23 floors of offices as well as a large atrium with a swinging pendulum. It sits on the corner of Georgia Street and Hornby Street facing the rear of the Vancouver Art Gallery. The painting is a present for someone who used to work in the building but has since relocated East. 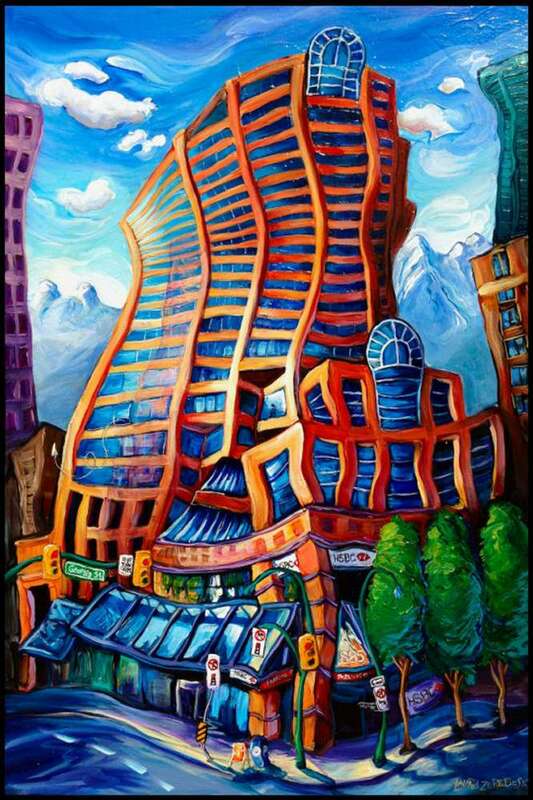 He found that he missed the co-workers and friends and experiences in Vancouver, so this painting will go in his current office as a reminder of where he started his career. The building’s shape, as I have interpreted it, is reminiscent of the prow of a large ship because ships are always the best metaphors for exploration and journeys. The light is coming from overhead West, which indicates late afternoon on one of those (rare!) clear fall days in Vancouver. A beam of light falls on the 7th floor, which is a conference room above the atrium where the recipient used to attend conferences and meet with a beloved mentor who has since passed away. If you look closely, there’s a faint silhouette in the window, like someone giving a lecture or looking out. A few doors down on the same floor, there’s a window that appears open with a small paper airplane floating out. This is where the recipient’s office was. The open window is a fanciful touch because the windows probably don’t actually open at that height, but it’s symbolic. For that matter, you can’t *really* see Vancouver’s iconic Lions or Crown mountains from this vantage point but you know they are right there. So there they are. In painting, like in life, it is more meaningful to add what is felt rather than seen.